In the life of Christ, His baptism in the Jordan is an event of the highest importance, because it represents a significant phase in the work of redemption. We know that the liturgy of the ecclesiastical year commemorates all the phases of Christ's redemptive work; and recently, during the season of the Nativity, we have reflected on His coming into the world, poor and solitary in a grotto at Bethlehem, and on His circumcision. Now His baptism in the Jordan marks the divinely inaugurated beginning of Our Lord's public life. Indeed, Saint Peter states that at His baptism, in fulfillment of the prophecy of Daniel, He was anointed by the Holy Spirit as the Christ, the Messiah, which means the Anointed One: God anointed Jesus of Nazareth with the Holy Spirit and with power, and He went about doing good and healing all who were in the power of the devil, for God was with Him. (Acts 10:38) An anointing has always been the symbolic, visible representation of an intimately established union, a specific, defined alliance or covenant between God and one of His servants. God the Father speaks at this moment, to make clear who this Person is. The foretold Saviour is His Divine Son, begotten from all eternity: This is My Beloved Son, in whom I am well pleased. 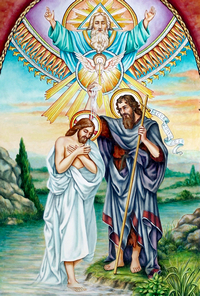 In the symbolism of His baptism, Christ, Himself immaculate, assumes the sins of the world, descends into the purifying waters, and raises mankind to divine sonship. His baptism was vicarious in nature; He stands in the Jordan in our stead. Consequently, this act must find its complement in our personal redemption. Our lives are profoundly altered through Christ's redemptive sacrifice, on at least three such occasions: our Baptism, our attendance at Holy Mass, and our death in Christ. At our Baptism we were immersed with Jesus, with Him we died and were buried. Then we emerged, and for the first time heaven opened to us, as the Holy Spirit made His advent into our soul, and our Father in heaven looked down upon us, now His sons, His children. In each Holy Mass, Christ's baptismal offering is again operative. Through the Holy Sacrifice we are immersed in His sacrificial death; heaven then opens and the Holy Spirit descends through Holy Communion. Through the pledge of the sacrificial Banquet the Father assures us of renewed and enriched sonship in Christ. The baptism of Christ is accomplished within us a third time at our death, if we are united with Him, for death is indeed a sort of baptism. Death is like immersion into the dark depths, but when we receive the Last Sacraments, on emerging, it is to a different life  it is our hope and our confidence, if we have been faithful to God's grace, that it will be the life of glory, the beatific vision. Then we will see the Blessed Trinity, no longer through the darkened sun-glass of faith, but in immediate vision, face to face. To sum up, today's liturgy helps us to understand more clearly the basic structure of spiritual life, the redemptive acts of Christ. Upon that foundation the edifice rises through the Sacraments of Baptism and the Eucharist, while the Lord's return, at our death, brings completion to the work. Go, and learn what this means: "I desire mercy, and not sacrifice."